Most people dislike doing laundry. It’s usually a half-day to a day’s job for a large family. But it was, in summer, a two-day job on the farm. In winter, it was an every day job. 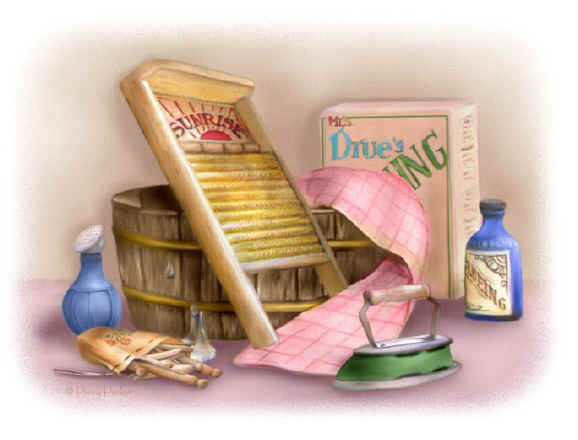 Mom’s “washing machine” was two wash tubs and a wash board. 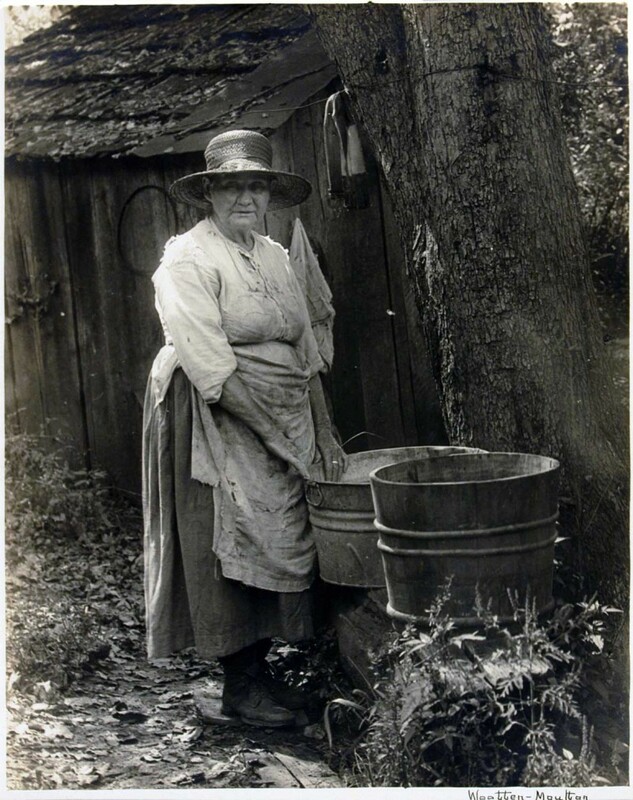 Her laundry detergent was her home made lye soap. 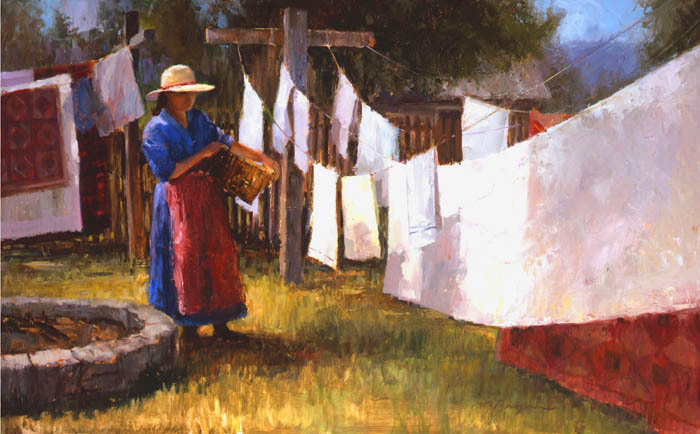 Her “dryer” was a clothesline, the wind, and the sun. Water was the biggest problem. On a hill-top farm, water is always scarce. Our well provided only enough for cooking, drinking, and bathing. We caught rain water from the roof, when it didn’t freeze, and when it rained. The rest we carried from the spring. 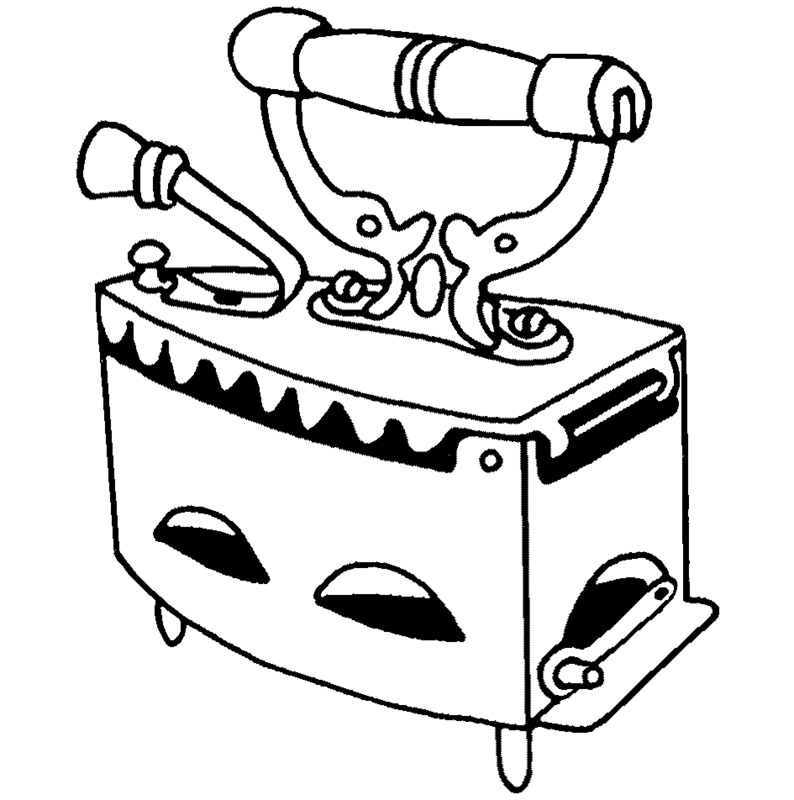 In winter, Mom often melted ice and snow for laundry water. 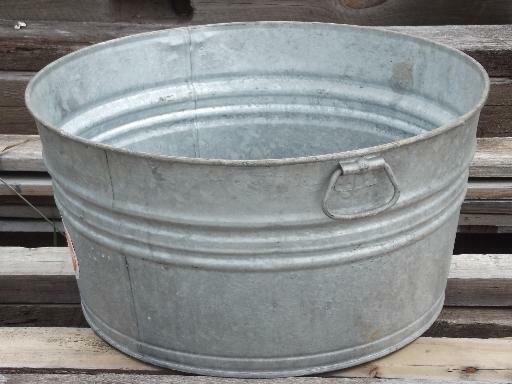 The water had to be heated in the galvanized wash tub on the wood-fired cooking stove. It took 8 to 10 gallons. She set up two wash tubs side by side on the wash bench. One had the hot, soapy water and the other the clear rinse water. The lye soap was shaved into thin flakes which dissolved. 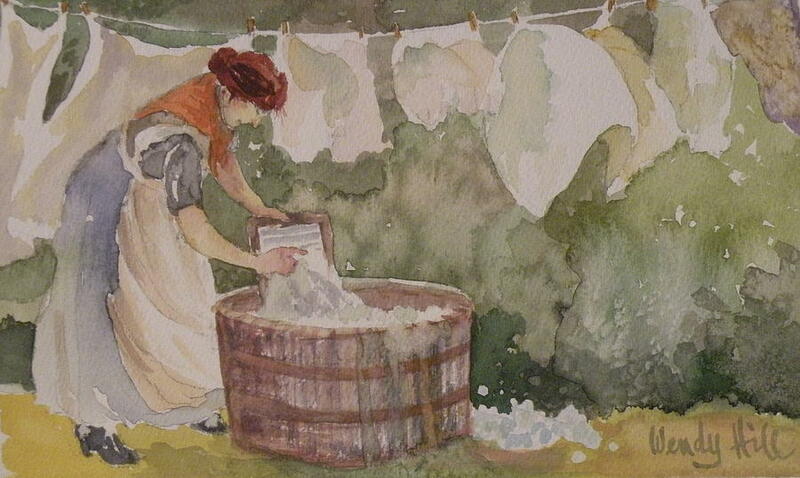 The clothes were soaked a few minutes and then scrubbed on the wash board. 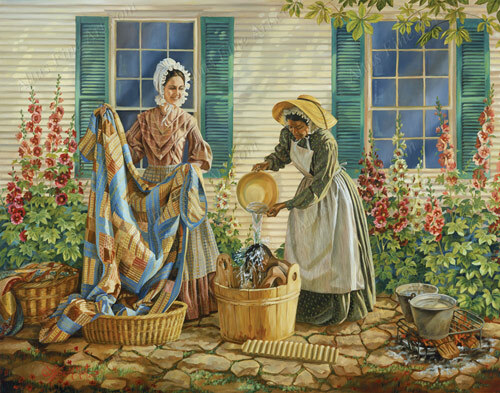 The wash board was about 4 times as large as the painted ones you now see at craft shows. She got the clothes clean, but it took a lot of scrubbing. Remember, there are no clean jobs on a farm - the clothes were really dirty. She washed the white ones first. After scrubbing them, she swished them around in the rinse water, and then wrung them out by hand. 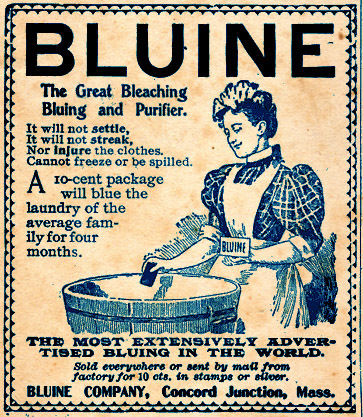 She used a few drops of Bluing, an intense blue dye, in the rinse water. That made the white clothes appear whiter. I, much later, discovered that a minute amount of dark, bright blue paint mixed in white has the same effect - it makes the white more intense. 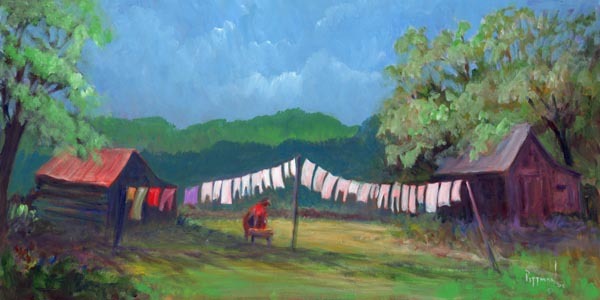 After washing, the clothes were hung on the line to dry. The nearly constant breeze on top of the ridge dried them quickly. 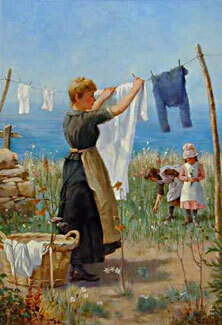 After the clothes were dry, Mom took them down from the line and sprinkled them with water. The damp clothes were then rolled up and let set until the next day. 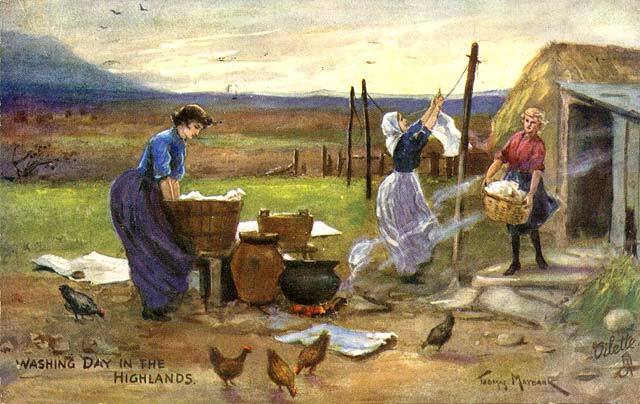 Weather permitting, washing was usually done on Monday with the ironing on Tuesday. 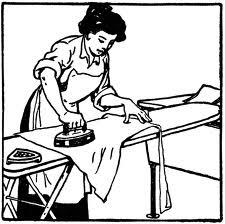 Sprinkling the clothes caused the hot, dry irons to create steam much like an electric steam iron does. Mom ironed almost everything - sheets, pillow cases, towels, etc. She used flat irons heated on the cooking stove. She had one handle with three interchangeable irons. The ironing board was set up close to the stove. In summer, it was a hot job. In winter, drying the clothes was a major undertaking. She hung clothes any place that wasn’t already occupied. She often hung them on the porch where they promptly froze. 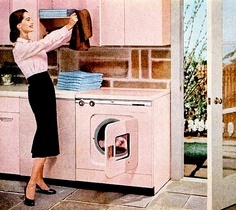 Then she would bring a few at a time in to dry in the house. 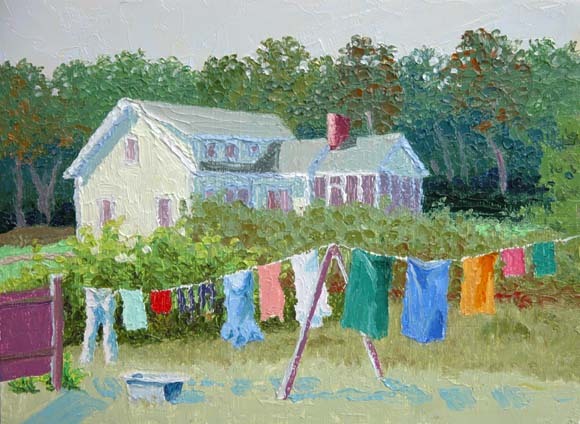 I still enjoy drying clothes on the line. It’s economical, I like the smell of sun-dried clothes, and most of all, it takes me back to my roots. The difference is that I do not have to. 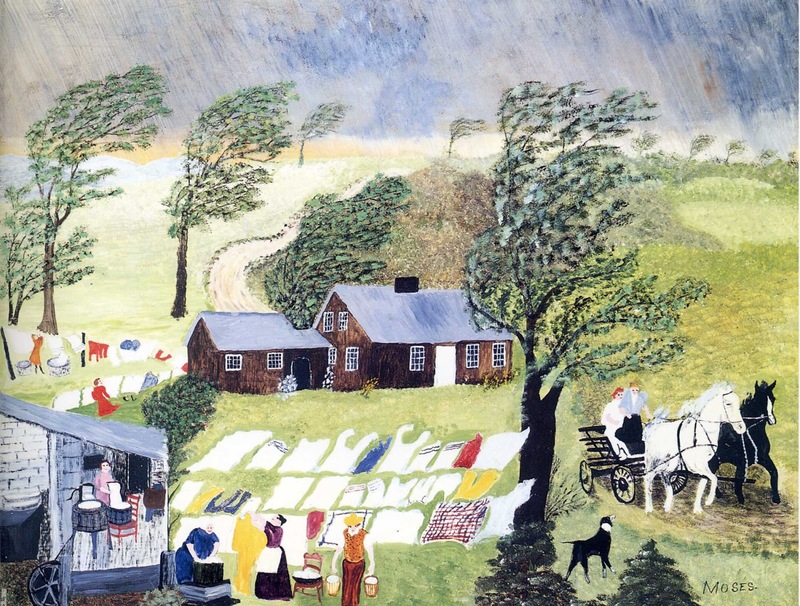 In rainy weather or in winter, the dryer works fine. My, all this laundry seems unfair! My, all this laundry cramps my style! being played very fast then coming to a sudden stop. So eight years I fought without Corporal Casey. My mom would hang clothes out in the freezing weather!! !